There has been 401 newly detected cases in 2017 compared to 282 in 2016. THERE HAS BEEN a 42% increase in the number of new patients detected with a bacteria that can resist antibiotics. 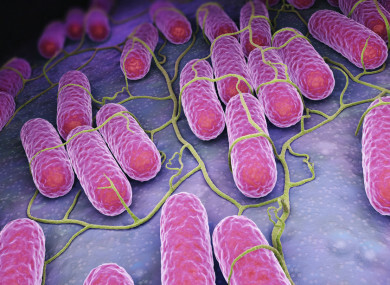 Called Carbapenemase-producing Enterobacteriaceae (CPE), the National Public Health Emergency Team has published its first situational analysis report that says there been 401 new cases found this year. That’s compared to 282 in 2016. The NPHET is not sure if this because of enhanced screening procedures or an actual increase in the number of people with CPE. In October, Health Minister Simon Harris declared that the CPE superbug is a public health emergency. More than half of all patients who develop blood stream infections with CPE die as a result of their infection. The HSE’s National CPE Action Plan says inappropriate prescribing of antibiotics, understaffing and overcrowding in hospitals and other healthcare settings, and lack of adherence to standard infection prevention and control practices are some of the factors in the increase in CPE reportings. Inadequate screening procedures and shortage of infection control specialists are also contributing factors. A National CPE Response Team was established in May this year to work with hospitals and other healthcare providers to combat the rise. The groups will gather data to understand why more patients might be infected with the bacteria, looking at hospitals, nursing homes and long-care facilities. This will assist with the main gaps they are facing as many relate to requirements for the reporting of CPE colonisation and the implementation of national requirements for screening in acute hospitals. Email “400 new cases found of Irish patients with superbug that is resistant to antibiotics”. Feedback on “400 new cases found of Irish patients with superbug that is resistant to antibiotics”.